For the last twenty years, Israel has led a large national effort aimed to integrate into the Jewish fold more than 300, 000 immigrants from the FSU, who are not considered halachically Jewish. But ultra-Orthodox parties in the government-coalition and the Haredi Orthodox rabbis who control the Chief Rabbinate, make every effort to sabotage it. As a result, in recent years only about two thousand immigrants from the former Soviet Union were converted each year. This is a far smaller number than that of the children born to the non-Jewish immigrants, namely - the scope of the challenge is rapidly exacerbating rather than being resolved. This is clearly a historic failure with far reaching ramifications. Even those who manage to convert, among them approximately 800 annually during their army service, face obstacles when attempting to marry and confront repeated attacks regarding the validity of their conversions. For decades, Jews around the world have been advocating that conversions of all major streams in Judaism be equally recognized in Israel. Yet, even after the High Court of Justice ordered the State to recognize Reform and Conservative conversions, grant the converts rights under the Law of Return and register them as Jews - still none of these converts can legally marry in Israel. A clear majority of Israeli Jews view converts of all streams in Judaism as Jews, as demonstrated in a poll conducted by the Ministry of Diaspora Affairs, and support equal recognition of their Jewish status. 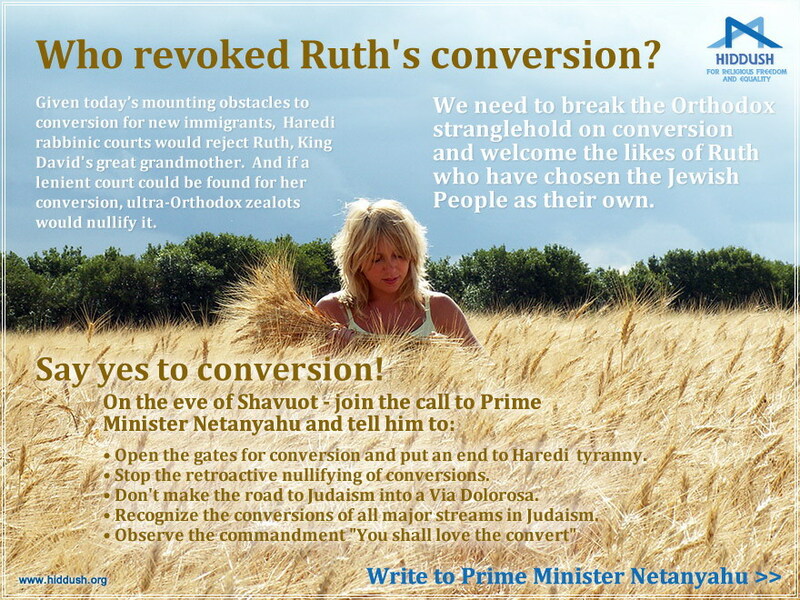 On the eve of Shavuot, the festival hailing the biblical Ruth and celebrating conversion to Judaism, let us join in calling on PM Netanyahu to remove the authority over conversion from those who do not want to convert, integrate our immigrant brothers and sisters in the Jewish fold, equally recognize conversions done under the auspices of all major religious Jewish denominations. Given today’s mounting obstacles to conversion for new immigrants, Haredi rabbinic courts would reject Ruth, King David's great grandmother. And if a lenient court could be found for her conversion, ultra-Orthodox zealots would nullify it. We need to break the Orthodox stranglehold on conversion and welcome the likes of Ruth who have chosen the Jewish People as their own. Open the gates for conversion and put an end to Haredi tyranny. Stop the retroactive nullifying of conversions. Don't make the road to Judaism into a Via Dolorosa. Recognize the conversions of all major streams in Judaism. Observe the commandment "You shall love the convert"
You are encouraged to ad to the text a short personal message. Please do so in an appropriate and dignified manner. The emails will be briefly delayed, to enable us to ensure that they meet these editorial standards. We, proud Jews from Israel and around the world, write to you on the eve of Shavuot, the Festival that celebrates conversion to Judaism. Bring joy to Jewish hearts, and justice to Jewish peoplehood, by rescinding ultra-Orthodox control over conversions. Open the gates of Judaism in Israel to our brothers and sisters who immigrated from the former Soviet Union and other countries, by fully and equally recognizing conversions of all the major streams of Judaism in Israel and abroad. This is vital for the sake of our converts, and it will strengthen Israel, Jewish unity, and the Jewish People's solidarity with Israel.